It has been almost two years since the seeds of the #MeToo movement were sown with the resignation of long-time Fox News Chief Roger Ailes following sexual harassment allegations filed against him by former Fox host Gretchen Carlson. The series of high-profile industry and entertainment figures that followed in Ailes' steps, including media mogul Harvey Weinstein, touched off an historic and long-overdue reckoning of injustice for victims of sexual harassment -- one that has since reached beyond the halls of Hollywood to boardrooms, businesses, locker rooms and legislatures in every state. The quest for accountability has extended to verbal injustices and attacks as well -- enter Roseanne Barr. 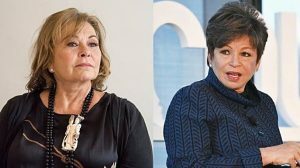 Barr, star of this year's hit reboot of the '90's sitcom "Roseanne," was fired this week following her racist tweet about former Barack Obama advisor Valerie Jarrett -- and took the #1 rated show with her. Although Disney-ABC executives were swift in canceling the show, sympathy for the estimated $100 million in lost 2-year ad revenue is tempered by their decision to invest in the boisterous comedian to begin with --given her long and documented history, on air and online, of bigotry and racism. It also underscores the often hypocritical and contradictory dilemma of an industry that is attempting a moral makeover while juggling the ongoing mistakes of yesterday's decisions. It is a worthy point for checking the progress of other industries as well on their efforts to correct personal and racial injustice. On Tuesday, Starbucks closed 8,000 stores nationwide to conduct racial bias training for employees. Last December a group of 54 female Democratic Congress members signed a letter to the chair of the House Oversight Committee, asking for an investigation into the multiple allegations of sexual assault and harassment against President Trump. Some industries are still behind. Help DemList with Contribution Today! The State of the Republican Race: Indiana has no notable footmarks in the history of presidential elections, but that changed yesterday. Convention 101: The first of regular updates on the 2016 Presidential Convention.